The quality is exquisite.... First and foremost, who wants a cheaply made panel..... Then add the tonal colors to make these panels Shine like they were meant to do!!! They are stunning, truly beautiful...…. Add a brush of color and character with this delightful blackout curtain panel. 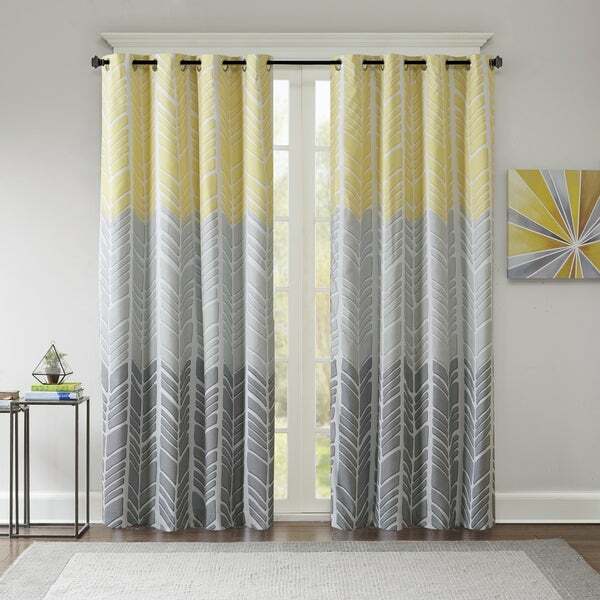 The geometric chevron design uses light, lovely colors in a unique ombre pattern for dimension and depth, and the foam back lining provides superior room darkening abilities. Why do pictures show two panels when you only get one? Aren't curtains supposed to be a pair? Thought I was getting a deal to find I got one panel per. Now I need to consider returning or paying more for something I didn't intend. 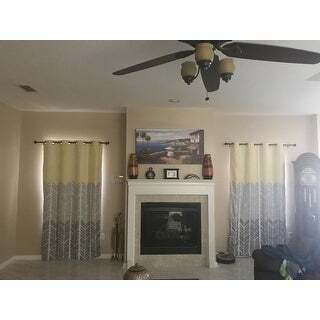 I am so satisfied with the blackout window curtains that I ordered 18 panels and used throughout my home. They are made well and keep out the light. The colors are exactly what is shown online. You will not make a mistake ordering these. I love them. I bought this curtain (with the teal colored top) for a small bedroom and it looks great. I made a mistake and didn't read the description well and thought I was purchasing a curtain pair, so I was surprised when I opened the package and only found one panel. I had to order a second panel, which was slightly annoying, but all my fault. Delivery was prompt. The fabric is heavy enough to drape properly and I didn't have to iron these prior to hanging (yay!). They are not completely light blocking, but when combined with a set of blinds on the window, do a good job of letting me sleep in later in the morning. 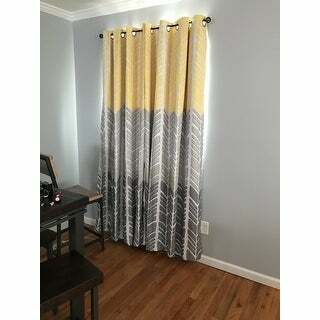 This is the second time I've purchased this brand of curtain and I would recommend it to others. These truly are blackout curtains and still feel very soft and nice. I ordered 4 panels for an extra large bedroom window and I love them! In love with my curtains! The material is amazing and keeps the light out. Love the quality and pattern! Very dark lining, which is good for blocking out the light. Bright, vivid detailed design. Good quality. I finally found total blackout curtains for my room and I got the aqua color. Now my room stays nice and dark, I don't have to worry about the light from the sun coming in, waking me up early in the mornings. I wanted to have a matching set and now I do. They compliment my room nicely and I'm very pleased with everything that I got. I would recommend these to my friends and family. True to color-well made! Provides excellent blackout. Recommend! It’s beautiful and good quality curtain! loved them but they did not block as much light as I had hoped. The material has a nice feel to it, and the curtains definitely reduce the light in the room. The print is a little less flowing (a little more computer generated appearance) than I could see in a small pic online. Went around and around trying to pick curtains for our condo, ordered these even though I was concerned about the color. Turned out that these were just right to provide a punch of color. love them! They look pretty, darken the room when I want them to and I can easily open them to let light in as they have the grommels at the top.They don't hang straight as in the picture, they tend to flare at the bottom, but its all good. Very nice curtains, made well. Very good quality, look great. Would highly recommend. Installed in guest room where the window is by the front porch light. Does a good job keeping the light out of the room. Would recommend. "If you can't iron these (it says on the tag) how do you get all the wrinkles out to get them to look nice??" "What color are the grommets? I have read description and reviews and it doesn’t say anywhere. Are they gold, silver, gunmetal?" "Is the price for the set (2 panels) or just one panel"
This is a single panel only. "Do these curtains come in 63 inches?" "Does this curtain come in 96 inch length?" This does not come in a 96-inch option. "Is this a bright or more muted turquoise in person?" It looks just like the picture... bright turquoise... but due to the grays, it's not overwhelming at all. "Why is it that these curtains can not be ironed?" It could melt the thin color fabric.